Share this product and receive a $3.00 sharing discount. Cream frame with Brown Dupioni silk sash and a cross rhinestone embellishment. Measures 10 1/2" x 9" and holds a 6" x 4" photo. Fru Fru Frames are a unique line of custom picture frames. All are hand made and are accented with Dupioni Silk sashes or bows, and rhinestone crosses. 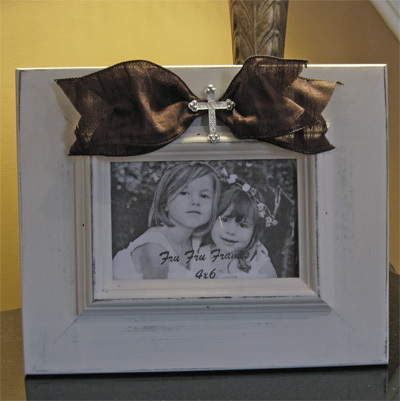 This particular frame makes the perfect First Communion, Baptism, Confirmation, Wedding, and/or House Warming gift.